How to create an outfit for second life using a digital camera, photoshop, and your own clothing. This Tutorial is a little more advanced, what we will be doing is using your own clothes, and turning them into second life clothing. This really isn't a whole lot different from just making a t shirt, but we will need a different template, there are many sites out there with advanced second life clothing templates, I prefer to use Robin Wood's templates which are available here. You can also download the free templates that second life provides from the second life website here. 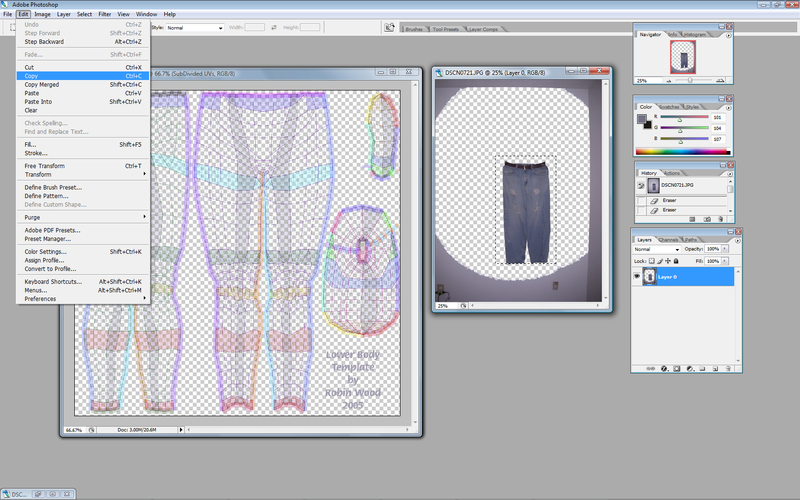 For this tutorial I will be using Adobe Photoshop CS2 and Robin Wood's upper and lower body template. A few more items you might need would be either a white or solid color wall to hang clothing against, or a big piece of white construction board. This is so that we can easily get rid of the background later. I also like to use a few thumbtacks to spread the clothing out on the wall or background. Ok now that we have our shirt made we need to create the pants and upload to second life. First resize the image like we did with the shirt something in the area of 1400x1867 pixels. Next open your copy of the Lower body template. Like before we need to change the image to a layer and use the magic wand tool to erase the background behind the pants. Anything left over erase with the eraser tool. Select the image with the rectangle tool and copy it. Paste the image onto the template. You will have to right click on the image and free transform it to fit the space. Just so your sure the front of the pants belong on the right side and the back on the left side of the template. 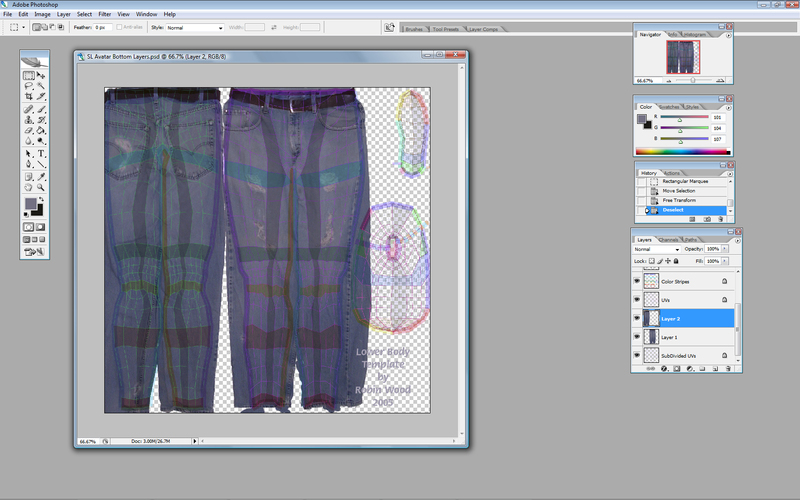 Once you get the pants in place fill in any needed areas, including the waist, with the clone stamp tool. Now do the same thing with the back of the pants and it should look something like this. Just remove all the extra template layers like we did with the shirt and save this file as a .png. Once you have completed both the shirt and pants you need to upload them to second life. If you are not familiar with uploading images to second life check out How to Use this Site. Once uploaded and worn on your avatar it should look like this. Once you learn how to do this you can make any of your clothing or anything you buy in real life into second life clothing! If you have any requests or pictures you would like turned into a free shirt please email me. I would be happy to fill requests in any catagory.